Yep, you've pretty much got it lol. Cloning is black magic, what works in one garden doesn't work in the next. Good advise post Captain Skunk, you have knack for that! If you dont have a ton of extra time and are trying to clone a lot of plants then you cant beat an aero cloner. Just chop extras n put em in the cloner and leave em for 2wks to over a month. I have been using LED at 24" over the clone bed. Seedlings thrive at this distance, but I am beginning to wonder, is the light intensity is too much for cuttings? 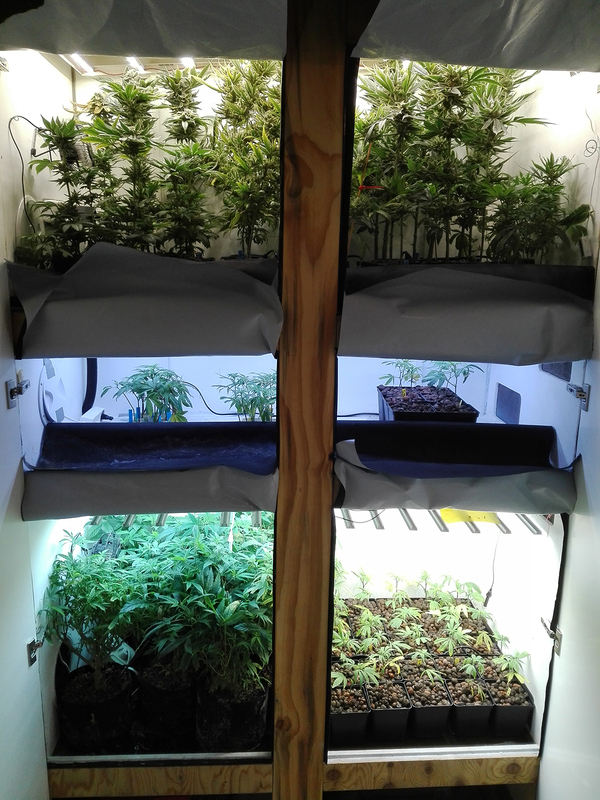 I have used pairs of 45W CFL, inches above the humidity dome with success. The same conditions result is substantial stretching of seedlings. Also light related, I have the light set on 16/8hr. It is in a room with a shaded window, but I prefer it to be off during the dead of night. I could switch to 24hr if that is the limiting factor. The midt section of this closet, and that is enough light for me to get nice roots. 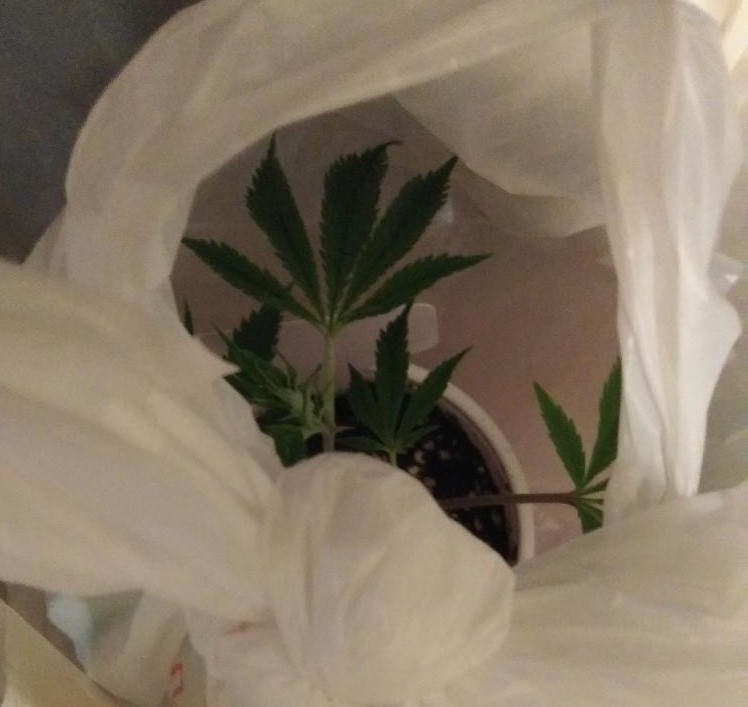 Many clones die simply to the fact, they get too much light and they start to grow. Given they have no roots, they will use the energy stored in them on new growth and die. Back when I grew on commercial scale, I would use 4x 36 Watt Fluro/CFL for 6-700 clones on a 4x8 ft. table. "Many clones die simply to the fact, they get too much light and they start to grow. Given they have no roots, they will use the energy stored in them on new growth and die...."
Words of wisdom, clearly from experience. Thank you. I suspect I have the source of my problem identified. looks like you have it going on there, Darth! Out with the LED grow lamp and in with a medium power CFL. Electric heater to combat the temp swings and 24 hr on-time. I intend to take another round of cutting, two from the bottom and two from the vigorous tops. Will continue to nurse along the survivors, be nice to have a second strain in the garden. 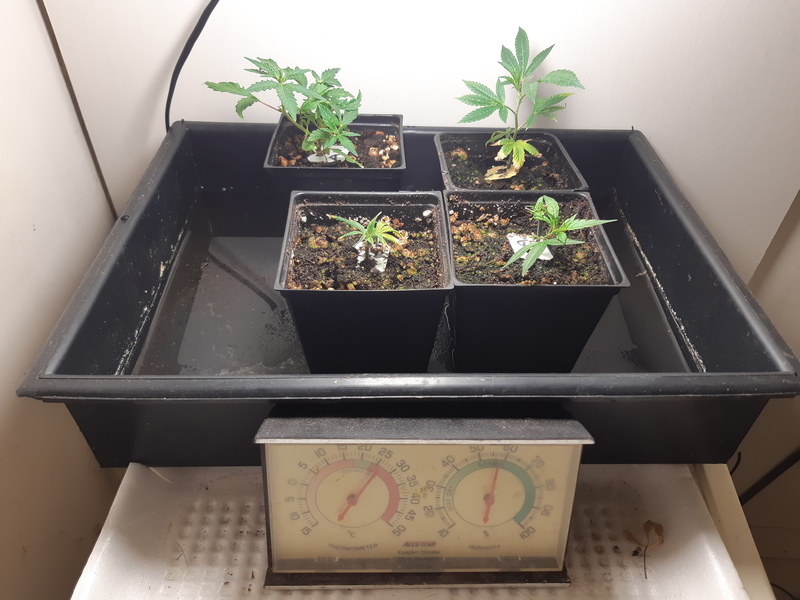 Not fully read through this thread read about air clones and dwc fancy stuff but I genuinely just chop the cut to where I’m happy with it, dip it in some clonex root hormone gel then some reggae roots powder. I shove it into a small pot of plain coco presoaked in PHed water. Under the HPS and within 3-5 days you’ve got plenty of roots there no need for building DWC systems or aero cloners simple works and has for a long while. Thank you Explorer, your experience is part of our collective knowledge. I thought I was following best practice, but forgot about a significant variable. Too much light, too early on defeats the best intentions. "Best" is a pretty subjective term, I do know there are a million ways to skin a cat as the saying goes....I was once challenged to be more "ghetto" in my growing...I've found sterility/humidity are the only things that matter...so with absolute sterility in mind this is what I used to clone..
Haha even more ghetto, this isn’t my method but sharing is caring take a plastic water bottle or any other plastic bottle that is clean. Make a cut in it to make it tall enough to hold some water about the size of a rockwool cube(which will be going in there), next put the pre soaked rockwool cube in the bottom take your cut dip it in whatever stuff you’re using then into the cube. It is indeed. I like to call the 'best' method the one where I get the highest rate of healthy cuttings at the same degree of development. For me that is aero. I also do not use any medium, I just have bare roots in gutter trays so the lack of rockwool cubes or peat pucks that might break up and block a valve or pump is a bonus. VBG great to see you again. We have been grow buddies since '03. Conditions are stable at 25-27C, Humidity up for this climate. 24 Hour of CF. Despite my best attempt to cook them with too much light, too soon. They have recovered. The front row, one is not growing vigorously, yet. Still dense green, still got hope. The other was down to a bare twig with tiny spark of green. It is doing great now. In the rear, that cutting has been nursed alone since early February. Cool,way to much light too soon, it has fought it's way back. Top performer is the Purple Candy, right rear. I find the simplest way is often the best. Cut a decent sized branch, clip 1/2 the fan leaves, scrape the bottom stem near the cut. I use Dip n' Grow liquid rooting concentrate at recommended levels. I then place the cuttings in rockwool cubes or plastic/styrofoam cups filled with soilless media (or pure perlite) I do not find using any humidity domes or heat mats to be necessary or helpful in any way. In this way, I can count on roots inside 14 days. I set the cuttings on the edge of the vegetative tent where light is less intense. I water with normal strength veg nutrients from the beginning. Keep the media moist and leave it the hell alone and you'll have success rates near 100%. To expedite the process, you can mist the cuttings daily with a tiny bit of extremely diluted Dip n' Grow. Like, 3 drops of hormone concentrate in a liter spray bottle diluted. It is crazy strong, a tiny bit goes a long way, and more isn't better. I have gotten roots in 7 days with this modification, nearly as fast as aero-cloners with no moving parts. To mist the cuttings, I also add a broad spectrum humic/fulvic/vitamin/amino supplement, but the hormone concentrate is the real star here. I have never had a cutting fail to root using both of these methods in conjunction.